In my first post on Modern Monetary Theory (MMT), I offered a general analysis of the theory, its similarities and differences with Marx’s theory of money; and some of the policy implications of the MMT and its usefulness for the labour movement. In this post, I want to delve deeper into the analytics of MMT. As I said in the first post, MMT is the child of what is called Chartalism, namely that money is historically the creation of the state and not, as mainstream neoclassical theory claims, an extension from barter trading; or in the Marxist view that money appears with the emergence of markets and commodity production (“Money necessarily crystallises out of the process of exchange, in which different products of labour are in fact equate with each other, and thus converted into commodities…. as the transformation of the products of labour into commodities is accomplished, one particular commodity is transformed into money.” – Marx Capital Vol 1). I won’t tackle whether Chartalism is an accurate historical account of the emergence of money. Instead, let me refer you to an excellent short account of the history of money by Argentine Marxist economist, Rolando Astarita, here. Astarita has also analysed MMT in several posts on his blog, and I shall draw on some of his arguments. Suffice it to say that to argue that money only arose because the role of the state in pre-capitalist economies is not borne out by the facts. Nevertheless, MMT starts with the conviction that it is the state (not capitalist commodity relations) that establishes the value of money. Leading MMTer Randall Wray argues the money takes its value not from merchandise “but rather from the will of the State to accept it for payment”. Chartalist founder Knapp says: “money is a creature of the law”; “The denomination of means of payment according to the new units of value is a free act of the authority of the State”; and “in modern monetary systems the proclamation [by the State] is always supreme”. Thus the modern monetary system “is an administrative phenomenon” and nothing more. Keynes also backed this Chartalist view. In his Treatise on Money, Keynes says: “the Chartalist or state money was reached when the State assumed the right to declare which account money is to be considered money at a given moment”. So “the money of account, especially that in which debts, prices and general purchasing power are expressed, is the basic concept of the theory of money”. I don’t think it is correct to say that MMT bastardises Keynes (as one comment on my first post argues) – on the contrary, MMT and Keynes are in agreement that money is a product of state creation as the state decides the unit of account for all transactions. But deciding the unit of account (eg whether dollars or euros) is not the same as deciding its value for transactions ie as a measure or store of value. MMT supposedly supports the ‘endogenous’ money approach, namely that money is created by the decisions of entrepreneurs to invest or households to spend, and from the loans that the banks grant them for that purpose. So banks make loans and so create money (as issued by the state). Money is deposited by the receivers of loans and then they pay taxes back to the state. According MMT, loans are created by banks and then deposits are destroyed by taxation, in that order. At a simple level, MMT merely describes the way things work with banking and money – and this is what many MMTers argue: ‘all we are doing is saying like it is’. But MMT goes further. It argues that the state creates money in order to receive it for the payment of taxes. The state can force taxes out of citizens and can decide the nature of the legal tender that serves for money. So money is a product of the state. Thus MMT has a circuit of money that goes: state money – others (non-state entities) – taxes – state money. The state injects money into the private sector, and that money is then reabsorbed with the collection of taxes. According to MMT, contrary to what most of us simpletons think, issuing money and collecting taxes are not alternatives, but actions that merely occur at different times of the same circuit. So if a government runs a fiscal deficit and spends more than it receives in taxes, the non-state sector has a surplus which it can use to invest, spend and employ more. The state deficit can thus be financed by creating more money. Taxes are not needed to finance state spending, but to generate demand for money (to pay taxes!). But the MMT circuit fails to show what happens with the money that capitalists and households have. In MMT, M (in value) can be increased to M’ purely by state dictat. For Marx, M can only be increased to M’ if capitalist production takes place to increase value in commodities that are sold for more money. This stage is ignored by MMT. The MTT circuit starts from the state to the non-state sectors and back to the state. But this is the wrong way round, causally. The capitalist circuit starts with the money capitalist and through accumulation and exploitation of labour back to the money capitalist, who then pays the state in taxes etc. MMT ignores this. But it shows that money is not exogenous to capitalist economic activity. Its value is not controlled by the state. MMT creates the illusion that this whole process starts and ends with the government when it really starts within the capitalist sector including the banking system. Taxes cannot destroy money because taxes logically occur after some level of spending on private output occurs. Taxes are incurred when the private sector spends and governments decide to use those taxes to mobilize some resources for the state. Private incomes and spending on resources precede taxes. Another Chartalist, Tcherneva writes: “Chartalists argue that, since money is a public monopoly, the government has at its disposal a direct way to determine its value. Remember that for Knapp the payments with currency measure a certain number of units of value. For example, if the State required that in order to obtain a high-powered money unit a person must provide one hour of work, then the money would be worth exactly one hour of work. As a monopoly issuer of the currency, the State can determine what the currency will be worth by establishing the terms in which the high-powered money is obtained“(page 18). Tcherneva’s policy of State ‘exogenous pricing’ is pretty similar to the views of 19th century utopian socialist John Gray who reckoned that by issuing bonds that were exogenously priced to represent working time, so economies could deliver growth and full employment – a view that Marx criticised. Where MMT differs from Keynesian-type fiscal deficit spending is that its proponents see government deficits as permanent in order to drive the economy up and achieve full employment of resources. In this way, the state becomes the “employer of last resort”. Indeed, the MMT exponents claim that unemployment can indeed be solved within capitalism. So there is no need to change the social formations based on private capital. All that is needed is for politicians and economists to recognise that state spending ‘financed’ by money creation can sustain full employment. MMT proponent Tcherneva writes: “Chartalists propose a policy of full employment in which the state exogenously establishes an important price for the economy, which in turn serves as an anchor for all other prices …. This proposal is based on the recognition that the State does not face operational financial constraints, that unemployment is a result of restricting the issuance of currency, and that the State can exercise an exogenous pricing (exogenous pricing)” This policy conclusion is rather ironic. It leads to a view that full employment can be achieved by the “exogenous” issuance of currency at a fixed price. And yet MMT is prominent in its rejection of the monetarist argument that an exogenous increase in the quantity of money will lead to a boost in economic activity. It seems that MMT also has an exogenous theory of money! One comment on my first post queried my claim that MMT exponents reckon that money can be created out of thin air – this was a distortion of MMT, I was told. The real argument of MMT is that government spending can finance itself by raising economic activity and thus more taxes. I did cite some economists who talked about ‘thin air’ but apparently these were not true MMTers. Well, British tax expert/economist, Richard Murphy, is definitely a supporter of MMT. He expounded that MMT first says “governments can make money out of thin air, at will… MMT then says all government spending is in fact funded by money created in this way, created by central banks on the government’s behalf… MMT logically argues as a consequence that there is no such thing as tax and spend when considering the activity of the government in the economy; there can only be spend and tax.” Similarly, Stephanie Kelton is currently the most followed MMT economist. She argues that governments can expand spending to whatever level necessary to achieve full use of productive resources in an economy by state money because such spending is ‘self-financing’. Money only has value because if there is value in production to back it. Government spending cannot create that value – indeed some government spending can destroy value (armaments etc). Productive value is what gives money credibility. A productive private sector generates the domestic product and income that gives government liabilities credibility in the first place. When that credibility is not there, then trust in the state’s currency can disappear fast, as we see in Venezuela or Zimbabwe, and even Turkey right now (I’ll come back to this in a future post). To quote Cullen Roche again: “productive output MUST, by necessity, precede taxes. In this sense it is proper to say that productive output drives money. And if productive output collapses then there is no quantity of men with guns that can force people to pay taxes… So the important point here is that a government is indeed constrained in its spending. It is constrained by the quantity and quality of its private sector’s productive output. And the quantity and quality of income that the private sector can create is the amount of income that constrains the government’s ability to spend.” This is Keynesian terminology: but if we alter the word ‘income’ or ‘output’ to ‘value’, we can get the point in Marxist terms. The state cannot establish at will the value of the money that is issued for the very simple reason is that, in a capitalist economy, it is not dominant and all-powerful. Capitalist companies, banks and institutions rule and they make decisions on the basis of profit and profitability. As a result, they endogenously drive the value of commodities and money. Marx’s law of value says value is anchored around the socially necessary labour time involved in the overall production of commodities (goods and services), ie by the average productivity of labour, the technologies and intensity of work. The state cannot overcome or ignore this reality. And it is reality. Let me offer some simple empirical evidence (something MMTers do not do). Government spending in modern economies, particularly the ones that dominate MMT thinking (they don’t have much to say on so-called emerging economies – but I’ll come back to that in the next post), like the US or the UK or the G7, is around 30-50% of GDP. Government investment is only about 3-5% of GDP. This compares with capitalist sector investment of 15-25%, while household spending varies between 55-70% of GDP. The quantity of domestically held government bonds in the US is just 4% of private sector net worth. I did a small empirical analysis of the relation between government expenditure and unemployment. According to MMT, you would expect that the higher the ratio of government spending in an economy, the lower the unemployment. Well, the evidence shows the opposite! Government spending in France is over 55% of GDP, while it is 39% in Japan and 38% in the US. But which of these three countries has the higher unemployment rate? France 9%; Japan 2.4% and the US 4%. Most advanced capitalist economies with higher government spending ratios had higher unemployment rates. This shows is that there are other reasons than the lack of state spending for the level of unemployment in capitalist economies. So state issuance is hardly a key driving force of the economy and employment. Of course, MMT exponents sometimes argue that this is the problem – just expand government spending, particularly investment, fund it by ‘issuing money’ and then the state will exogenously overcome or bypass failing capitalist accumulation. But this response immediately begs the question, studiously ignored by MMT, that it is the capitalist sector that runs modern economies, for better or worse, not state money. Is it realistic for MMT to claim that the only reason modern economies have unemployment is because politicians do not adopt MMT and so let governments spend as much as necessary, backed by issuance of state-controlled money? That is certainly not the view of Keynes or Marx. Keynes reckoned unemployment emerged because of the lack of investment by capitalists; Marx said the same (although the reserve army of labour was the result of capital-bias in capitalist accumulation). The difference between Marx and Keynes was what causes changes in investment. Marx said profitability; Keynes said ‘animal spirits’ or ‘business confidence’. Both saw the faultlines within capitalism: Keynes in the finance sector; Marx in capitalism as a whole. In contrast, MMT reckons it is only the failure to allow the state to expand the issuance of money! But perhaps the most telling critique of MMT is that, because it has no recognition of the capitalist sector in its circuit of money and only the state and ‘the non-state’, it can tell us nothing about why and how there are regular slumps in production and investment in modern economies. On this issue, MMTers have the same position as orthodox Keynesians: that it may be due to a lack of ‘effective demand’ or ‘animal spirits’ and it is nothing to do with any contradictions in the capitalist mode of production itself. But for MMTers this issue is irrelevant. MMTers take the same view as orthodox Keynesian Paul Krugman, namely that it does not really matter what the cause of a depression is; the main thing is to get out of it with government spending – in the case of Krugman through judicious government spending through bond issuance; in the case of MMT by government spending financed by the issuance of money. Call me old fashioned, but I think science works best by finding out what causes things to happen to better understand what actions can be usefully applied to prevent them (vaccination for diseases, for example). Blindly hoping that government spending will do the trick is hardly scientific. Indeed, much work has been done by Marxist economics to show that it is the faultlines in the profitability of capital that is the most compelling explanation of recurring crises, not lack of demand or even austerity in public spending. And that implies action to replace completely the profit-making monetary economy. The answer to unemployment or the end of crises does not lie in the simple recourse of issuing money, as MMT claims. MMT relies on what Marx called “the tricks of circulation” – “the doctrine that proposes tricks of circulation as a way of, on the one hand, avoiding the violent character of these social changes and on the other, of making these changes appear not to be a presupposition but gradual result of these transformations in circulation”. MMT claims that it has an endogenous theory of money, but in reality it has an exogenous one, based on state issuance of money. It claims that government spending can be expanded to any level necessary to achieve full employment through money issuance, without any reference to the productive activity of the non-state economy, in particular the profitability of the capitalist sector. Indeed, according to MMT, capitalism can be saved and achieve harmonious growth and full employment by ‘tricks of circulation’. MMT ignores or hides the social relations of exploitation of labour for profit. And by selling ‘snake oil’ (MMT) instead, it misleads the labour movement away from fundamental change. This entry was posted on February 3, 2019 at 1:53 pm and is filed under capitalism, economics, marxism, Profitability. You can follow any responses to this entry through the RSS 2.0 feed. You can leave a response, or trackback from your own site. Michael, the problem with the data shown in the graph is that MMT argument is in terms of deficit spending, not spending per se (unadjusted for revenue). And it could also be the case that unemployment could be much higher without government spending. Marcelo – i’m not sure that I agree. MMT says it is persistent and sustained boosts to govt spending that will deliver full employment. That would mean a rising and high ratio of govt spending to GDP over time. My graph shows that there is no justification for that proposition. You say use budget deficits not total expenditure. If I do that I find (again) that the bigger the deficit, the higher the unemployment rate (even if I take out the highest rates for Greece and Spain)! Actually that is not surprising because deficits expand when unemployment rises due to automatic stabilisers like unemployment benefits and falling tax revenues. Germany runs surpluses on its budget and has low unemployment rates. This suggests that unemployment depends on economic activity in the capitalist sector not on state spending (deficits or not). It would probably be better to do a second derivative measure of the effect of higher budget deficits over time on changes in employment. But this would be similar to the Keynesian multiplier – and that has been shown by me and others to be much weaker in its impact than changes in profitability on growth and employment (because capitalist investment is what counts). However, if MMTers don’t agree, let them do some empirical research and not just make theoretical assertions. First things first: there’s no categorical difference between deficit spending and spending in the MMT system, since to achieve deficit, you (the State) must spend — and, since the State can create money from thin air, spending = deficit (unless, for some cosmic reason, the State willingly doesn’t do that). So, this is a typical “tomato tomato” situation. Your second assertion is a fallacy, because, with the same logic, I could argue that State spending is the symptom, not the cause, of rising unemployment: the private sector is failing and the State, in a desperate measure, is doing extraordinary things to fix something it shouldn’t be fixing (like when an organ of the human body fails and the brain designates another organ to try to fill the gap, thus sacrificing two organs). So, this is a typical situation of “if my aunt had wheels, she would be a bicycle”. VK: Yes, there is.a difference. Money is issued to cover the difference between tax revenues and spending. Abba Lerner argued that spend should go up to the point of full employment, and deficits could be covered by money printed. Banks also create money from thin air. If a capitalist borrows from a bank and invest, creating jobs, the effect is the same. The point is the MMTers do not believe that capitalists will do that on their own. Regarding your secund assertion, it seems that you never heard about counterfactuals. Time to study a little bit more. You could start with Anwar Shaikh. He did some counterfactual exercises regarding the falling profit rate. Except contemporary States only do QE as a last resort. The usual tool is to issue bonds. Indeed, Marx covered that under one of his examples of “fictitious capital”. Indeed, a State can issue bonds over its debt without the debt itself existing — all it needs is a corrupt government (a president under the banking system’s pocket) to say there is a hole on the State’s budget and issue the bonds at a given interest rate. And I didn’t understand your snark at my counterfactual: you stated that, if a State didn’t spend, unemployment would be even worse than it is now. Then you extrapolated this assumption to posit the State, alone, can eliminate unemployment. Even assuming those are right, you have a “which came first” dilemma: by the same logic, you could say a capitalist society shouldn’t be working like that, that is, unemployment became too high and the State had to intervene as a last resort to preserve the social fabric of capitalism (let alone eliminate unemployment). There is no need to reinvent the wheel. The multiplier has been estimated extensively, and routinely found to be large. The multiplier can be whatever. It doesn’t change the fact that, best case scenario, MMTers are positing a Deus ex machina (the capacity of the State to create money directly pegged to wealth) as a perpetual fix to the inner contradictions of capitalism. The State has a weight on the market when it intervenes for the simple reason it is a big player, not because it has some magic power to create wealth. MMT (and Keynesianism) has a fundamental flaw, not an empirical one. As a lay person I am struggling to understand this post. Leaving aside the political obstacles, if the government of Spain decided to start a Job Guarantee program that pays the minimum necessary for a person to cover basic needs (e.g., $1000/month), that would set the level of wages for the whole country (all the companies would have to, at least, offer that wages to their workers). Now let’s imagine the olive oil industry, even after consolidating in one company, fails to be profitable at that level of wages. At this point, the State could decide to absorb it into the public sector, if considered important, or let it fail if superfluous or detrimental (e.g., soda). As I see it, it would force entrepreneurs to look for more productive investments instead of pushing wages down to increase margins in low productivity industries. It would also set a cushion: anyone could try his/her own business knowing, at worst, she/he would end up back in the job guarantee program. Given the falling rate of profit over time, the State would keep absorbing industries that ended their ‘profit cycle’, while new ideas for potential profits would keep springing up (e.g., as innovative spin-offs of state companies or novel products/services). In the extreme case the State ended up absorbing all the industries and services in a country with zero initiative from the private sector, wouldn’t that country reach a form of socialist economy? (I am not being facetious, just talking from ignorance). Pablo – a job guarantee scheme that involves the state taking over industries that fail to guarantee jobs at decent wages is fine by me. But that is not what MMTers propose. This scenario is impossible in capitalism because, in this case, it would be the State descending to the level of a normal “player” in the private sector (albeit, maybe, a huge “player”). So, if that happens, the State would be susceptible to the same laws of capitalist reproduction: it would have to profit, it would have to produce real things, etc. etc. A scenario where the State could completely “cover” for the private sector would already be, basically, a medium-advanced stage of socialism. Even the Chinese State (which is socialist, albeit, as the Chinese themselves officially claim, a very primitive stage of socialist — “market socialism with Chinese characteristics”), which owns the most strategic companies and thus is capable of gifting its working class with generous tax cuts, depends on the private sector running things in the non-strategic sectors. If you tackle the issue through an exogenous theory of money, then what would happen is simply that inflation would go up, because the bulk of the society would receive fiat money at the same time. Money printing is only effective as a capital centralization tool: the biggest capitalists receive the money first, so they enjoy lower prices, and a cascade effect begins as this extra fiat money circulates. When the last person receives this extra fiat money, prices have already gone up, but means of production are already at the hands of the bigger capitalists. The increase of the productivity of labor on a global scale since the end of WW2 in particular underlies the claim of MMT that the US today can run deficits without causing inflation. There is plenty of value being produced but the capitalist system of private appropriation and social production in combination with the capitalist state blocs production and distribution for human needs. Can’t MMT be used to point out how capitalist social relations and the capitalist state are fetters on the development of the means of production which has reached such a level of productivity? Running permanent deficits as Japan has done has not led to rising inflation. But then growth is lower than before the GR everywhere. What running deficits may mean however is a stock market bubble as increased profits from tax cuts are switched to financial sectors, with investment and productivity staying low. Marx’s law of profitability explains the transitional nature of capitalism better than MMT. Sean, US military/market power forces the transference of much of the value created by increased global labor productivity (particularly value created in the global south) to the US and its NATO satraps. This transference of value created by super-exploited labor allows the United States to maintain a surreal deficit relative to its GDP with low inflation of its (military/oil backed) hegemonic dollar . It would be interesting if micheal could explore the economics of currency in Soviet Union and MMT, specially if we consider the Soviet Union as employer of last resort and job guaranty over there! Thanks for another great post! What is your model’s R-squared? For a lot of the observations in the middle it looks like there isn’t much of a relationship at all between budget deficits and unemployment. It would be interesting to see which counties are which, but probably hard on the eyes. Wouldn’t MMTers say you can’t include the countries using the euro separately? Thanks again! Nick – yes good points. 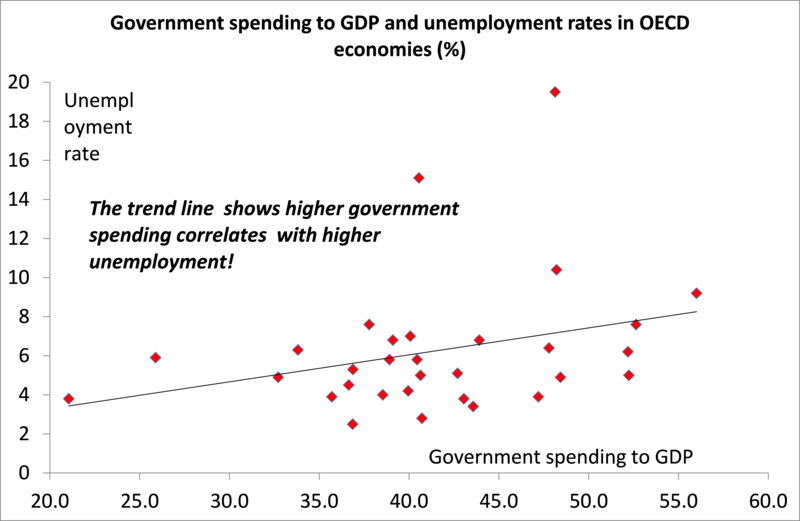 The R-squared on the government spending/unemployment scatter is 0.30 – meaning that there is a positive correlation between higher govt spending and higher unemployment. When I did a correlation between budget deficits and unemployment I found that the lower the deficit, the higher unemployment with an inverse correlation of -0.13 – not very high. So you are probably right that there is little relationship. In response to your point about making the euro just one country and not many, I redid the correlations and found that the positive correlation between high govt spending and high unemployment was even stronger (R-squared 0.43)! However the correlation between higher budget deficits and higher unemployment reversed so that higher budget deficits correlated with lower unemployment (but only at a 0.18 positive correlation). But the data universe I used is probably inadequate to reach firm conclusions and a time series and weighting for GDP and employment size might be necessary especially for the budget deficit analysis. And we might need to look at structural deficits that exclude cyclical effects. I look forward to MMTers coming forth with empirical work. But then you would have — if you still want to remain an anti-Marxist ideology (as MMT appears to want to be) — to admit you have an exogenous theory of money: if that’s the case, then you would’ve been admiting value through the front door only to expel it through the back door (theoretically). Another possibility would be to admit MMT is not really a theory, if we are to adopt the rigorous concept of the term, but rather a faint doctrine made up by a confederation of loose economists, each one interpreting the thing as he/she sees it fit (as is the case with many “theories” in vulgar Economics). The credit that banks give to capitalists is an advance on all “savers” ( the entire capitalist class) to a single capitalist who, upon receipt of that advance, must assure that he pays the capital received at a certain rate and on time repay. The bank manages, collects and distributes and thus increases the unused savings of all capitalists – savings, which are in each case too insignificant to act as capital. The bank does not create money, but collects and manages other peoples money that has arisen in the capitalist production process. Only this production process creates and increases values that partly take the form of goods and partly the form of money. If a bank could make money out of nowhere, there would be millions of banks and each of us could be a owner of a bank. Yes, the bank awards more loans than the sum of money it manages. But this “more” is by no means arbitrary. All loans granted by a bank are in proportion to the funds that a bank administers. This “leverage” is 1:10 for well-managed banks and 1:20 for speculative banks. This “leverage” is calculated from the inflow of managed funds and the return of lending. If a bank lends “extra money” that it does not have yet (alleged “money out of nothing”), then it does so in advance and in anticipation of its likely future inflow of funds. If the money flows back, as contractually promised, then the bank remains solvent. If the money does not flow back, as contractually assured, then the bank has problems and finally goes bankrupt. If a bank does not have access to third-party funds, it can not lend. That a bank “makes money out of nothing” is a naive idea without insight into the functioning of capitalism. Sorry for my bad Englisch! Banks can — and do — create money. See “scriptural money”. Banks do not create extra money because they do not add value. The capital cycle alone creates additional value and thus additional money. However, the banks are the agents where this extra money becomes visible and documented. Part of this extra money is collected by the banks, on the other hand, the banks give “additional” money as a loan in anticipation of the capital cycle. Apparently, these loans are created “out of nothing”. In fact, this additional money is only “created” by the intention and promise of a capitalist to produce additional value. In fact, the bank here is the agent of the entire capitalist class who lends a credit to an individual capitalist. Money is not value. Value is socially necessary labor time (the substance of value). “But what is money? Money is not a thing but a certain form of value, … “K. Marx, Capital III, MEW 25, 870. Money that does not represent value is not money. Money that represents a fictional value is fictitious money. I don’t think this is quite what MMT says or what exists. Bank loans do create deposits, and in this sense they do create “money” (I call it “bank credit”) but they do not create state “currency.” Obviously, this is a matter of definitions, but there are real reasons to distinguish between currency the State issues and bank credit that is created by bank loans. When the government makes a payment (say to an employee), then it credits the employees bank account and aggregate reserves in the banking system increase by the amount of that payment. That “currency” will exist in the system (as reserves) until it is taxed back out. (Even if the employee spends that money, it will go into another person’s bank account as a deposit and wind back up as reserves, leaving aggregate reserves unchanged). When a bank makes a loan, a deposit is created, but aggregate reserves in the system remain unchanged. The bank does not have the power to create reserves. Moreover, when bank credit is issued, it creates both financial assets and financial liabilities that net to zero. The bank has an asset (the loan) and a liability (the deposit). The borrower has a an asset (the deposit) and a liability (the loan). While the bank credit does create greater spending capacity within the private sector, no government currency is created, and no net financial assets are created within the private sector. The loan, after all, has to be paid back. Repayment of the loan destroys the bank credit. Think of it as a balloon that temporarily inflates spending capacity during the life of the loan. Bank credit operates on top of government currency. So bank credit (denominated in US dollars) is created when a loan is made and destroyed when it is repaid. Aggregate reserves remain unchanged throughout this process. Governments issue currency when they spend, which increases aggregate reserves in the system. Governments revoke (destroy) currency when they tax, which reduces aggregate reserves in the system. Look for language in MMT literature about “vertical” and “horizontal” transactions for more information about the difference. Vertical transactions occur between the currency issuer (government) and non-currency issuer (private sector) and change the amount of aggregate financial assets the private sector has. Horizontal transactions occur entirely within the non-currency issuing private sector and cannot change the amount of financial assets it has. Only the government can do that, and that is an important insight of MMT, and what makes the government necessarily the regulator of economic activity. In a fiat monetary system, it has no choice but to be. I get that with respect to real assets, but not with respect to financial assets. Financial assets are abstractions. If I am a bank and I have a financial asset in the form of an outstanding loan of $10,000, and the government increases spending so much that it creates 100% inflation, doubling the price of real goods and services (halving the value of currency as it relates to goods and services), then the value of my financial asset has indeed been cut in half. But what I mean by it being the regulator of economic activity is that it provides the oil for the gears of a capitalist economy to run, and that, so long as the private sector uses its currency, it cannot avoid that role. It also necessarily determines the level of unemployment, which is produced by inadequate spending (oil). So MMT shows us that it is the government itself–not the private sector–that creates and maintains unemployment, even in a capitalist economy. This demonstrates a pretty powerful link between capitalism and the state, in my opinion. What you stated in you comment is simply not true. A State can or cannot issue currency to pay its employees. There’s no creation of destruction of currency during the payment-taxation process. Taxation doesn’t destroy currency. One thing is money as unit of account, another thing is money as reserve of value. MMT would not contend this. MMT is interested in NET spending, meaning annual deficit or surplus. Net spending can be increased by increasing spending OR cutting taxes. Net spending can be reduced by cutting spending OR raising taxes. Deficits inject financial assets into the private sector. Surpluses withdraw them. Also, one has to consider the external sector. A country that has a current account surplus (e.g., Norway) has financial assets flowing into it from abroad. Aggregate spending (and full employment) can be sustained in such a country with less net government spending. Indeed, if the surplus is big enough, the government might have to reduce its own net spending to avoid inflation. In short, the metrics you used wouldn’t tell us anything about MMT. And even if you looked at net spending, you’d still have to control for the external sector. The MMT policy as I understand it is that governments should run permanent budget deficits to inject net surpluses into the private sector until full employment is reached and keep those deficits going unless there is significant inflation. That suggests to me that govt spending to GDP must get higher and stay high to achieve full employment, unless MMT advocates tax cuts as the way to run the deficits and MMT proponents do not as they want more government spending on infrastructure etc, not tax cuts for the rich. I looked at the data for govt net borrowing to GDP against unemployment and found that the lower the net borrowing the LOWER the unemployment rate – contrary to expectations. This suggests that there are other factors than government net borrowing that drive employment in capitalist economies. The correlation is fairly low, however. Indeed, one factor may well be the external surplus, as you say. So I looked at that relationship and yes, the higher the external surplus, the lower the unemployment rate. So the likes of Germany and Norway can deliver lower unemployment because their capitalist sectors are doing well in net exports. So it seems that net government borrowing is not as significant in achieving employment as capitalist sales are – the positive correlation with unemployment for the latter is double the inverse one for government borrowing. But I think more work is needed on this – thanks for the inspiration on this. “not tax cuts for the rich.” It would be tax cuts to the “not-rich”. Taxes, of course, serving only the Pigouvian purpose of “to correct an undesirable or inefficient market outcome, and does so by being set equal to the social cost of the negative externalities” – wealth inequality is a huge negative externality vis-à-vis a healthy political process. You’d want to look at net borrowing as % of GDP + current account as % of GDP. But even this probably won’t tell you much, because there’s also private credit in the mix. Private credit can fill a void left by inadequate government spending (think late 90s USA and just before the GFC). But there are limits to this, because (unlike the government) the private sector can only indebt itself so much (Minsky moment). Neoliberalism is probably best understood as just this approach (maximum reliance on the finance sector). You can see this when you look at private debt loads as a % of GDP over the last 50 years, which skyrocketed. Austerity is best understood as a finance sector policy, the purpose of which is to drive households and businesses to the finance sector for loans. The west has operated in a kind of permanent austerity since the mid 70s. Occasional “stimulus packages” are passed out of sheer necessity. Anyway, the real reason why growth rates are so paltry in the west now is because the trick of using the finance sector to sustain growth can only be done once. Once the private sector becomes overloaded (as it is now), the system breaks down. That’s what we’re seeing now. To be sure, the neoliberal (finance sector) governing class is trying to press forward, but they are up against the limits of it. The public is not taught the correct way our currency system operates. You have absorbed the same basic misconceptions that make any further discussion on these themes of little use. Also, you continue to quote and discuss people and ideas that are simply not accurate depictions of “MMT”. Until you read and understand Warren Mosler, L Randall Wray, and Bill Mitchell then you simply do not understand “MMT.” You have to read the source, just as you read Marx. Scientific knowledge is missing in economics. This is the actual state: The major approaches ― Walrasianism, Keynesianism, Marxianism, Austrianism, MMT ― are mutually contradictory, axiomatically false, materially/formally inconsistent and all got the pivotal concept of the subject matter ― profit ― wrong. As a result, economists discuss the various approaches until they are blue in the face without ever taking notice that their stuff lacks sound scientific foundations. This is the case for Walrasianism, Keynesianism, Marxianism, Austrianism, and MMT which are all axiomatically false, i.e. based on provably false premises. There is no need, to study MMT in greater detail and to bother oneself with different interpretations. It is absolutely sufficient to prove that one premise/axiom is false.#4, #5 This collapses the whole verbal superstructure of interpretations and confused blather. #6 Why is economics a total scientific failure? Well thanks for that. You tell us we are wasting our time because economics is not scientific and rigorous. But low and behold, you give a blog site where you claim that your economics is superior and scientific. So it seems you also are just “one among many” and are also going “blue in the face”. Keep up the good work. You summarize: “You tell us we are wasting our time because economics is not scientific and rigorous.” and counter: “… it seems you also are just ‘one among many’”. Take notice that there are some differences between blathering and scientific proof. • Because the theory is defective, Marx’s policy guidance NEVER had sound scientific foundations. • After-Marxians have not spotted Marx’s foundational blunder to this day. Because both Marxianism and MMT are false, any discussion about and between these two goofy approaches is not more than a sitcom. Your scientific definition comes from people who have never done science themselves (Thomas Aquinas, Aristotle). Your theory that there can nothing right follow from false assumptions has been practically refuted by mankind a hundred thousand times. The old sailors have oriented themselves to a starry sky, which was fixed in their eyes (“firmament”), but they still came to their destinations. In your eyes, a science is refuted when it produces conflicting interpretations. According to this motto, all previous science has already been refuted, including astrophysics. The spacers take little care. I read you paper and, I’m sorry to tell you, you’re part of the pseudo-science problem you denounce. 2) you, out of the blue (because you don’t demonstrate it with your endless mathematical formulas), concurs with Marx in that capitalism is not an equilibrium system — but you come to an equilibrium system conclusion (that classes exist but aren’t antagonist to each other, only between themselves: if a capitalist group robs its exploited working classes, it is automatically transfering this extra profit to the other capitalist’s working class, evening the whole economy out). 3) even when you state that it isn’t the case, you posit a non-social theory: everything can happen, profit (or break even, or loss) is purely aleatory; things can go boom or bust at any time between capital rotations. This breaks the most essential rule of society: it must be able to reproduce itself on the long term. That’s what differentiates it from a random group of people. So evolution cannot then be a valid scientific theory! Is it difficult to comprehend that it is exactly the multiplicity of interpretations that renders a theory scientific? Were this not the case, then we would be dealing with revealed truths of a religious ascription. Marx and Engels both emphasised that their theories had to be developed, since society itself develops. For the founding fathers, Political Economy was what is today called sociology. Economics started as a hodgepodge of sociology, history, folk psychology, and folk philosophy (a mixture of utilitarianism, Hegelianism, Malthusianism/Darwinism, Individualism/ Protestantism). The two issues ‘how society works’ and ‘how the economy works’ were not properly kept apart. Clearly, the blunder lies in the definition of economics as a social science.#2 Fact is that economics is a system science that deals with how the monetary economy works. Sociology, on the other hand, is a so-called social science or a cargo cult science as Feynman so aptly characterized it. The characteristic of the so-called social sciences is endless blather and interpretation and meta-communication and political agenda pushing. Economics as a system science figures out what the systemic laws are. For example, the macroeconomic Profit Law is given by Q=Yd+(I−S)+(G−T)+(X−M) and it consists of variables that are measurable with the precision of two decimal place. NO interpretation here! From this equation follows, inter alia, that Keynes’ I=S is false which, in turn, means that all IS-LM models from Hicks to Krugman are false. NO interpretation here! As far as economics deals with psychology/sociology it is fake science just like the so-called social sciences as a whole. I agree with you that Economics is a pseudo-science. What we’re stating here — and you, aparently, don’t seem to understand (or pretend to) — is that you are one of those pseudo-scientists. And Marx was not an economist (neither classical, nor vulgar), nor a social scientist. Sociology was a 20th Century invention (and, I agree with you, is also a pseudo-science, or at best, a proto-science). Economics can be a science when it is Marxist. It is a pseudo-science when it is non-Marxist (i.e. “vulgar”). Political Economy (aka Classical Economcs) is dead, so there’s no point in talking about it nowadays. Marx is 100% science. There’s no debate about that. Please, don’t include Marx on the cesspoll of these guys you quote (and of yourself). A full understanding of the power of the state is dangerous to the bourgeois as it reveals that a left government coming to hold state power has the capacity to intervene decisively against their interests. The currency issuer can always outspend a currency user, even a vast corporation or bank. MMT explains correctly that the state is the ultimate authority over a currency, not the private sector capitalists. This was demonstrated clearly during the global financial crash in 2008 when the free marketeers came squealing for the protective bosom of the capitalist states across the world. Not one grain of rice (real wealth) was lost in the global banking system meltdown a decade ago. What was lost was capital’s monetary claims on the real wealth of goods & services produced by the working class as they saw the digits tumble in their bank accounts. The capitalist states then waded in and bailed out the capitalist class to the tune of many trillions with their unlimited monetary capacity. The “crisis” was then used as pretext to drive the working class back even further under the austerity (planned poverty) program which is based on the fallacy of the currency issuer being fiscally constrained. The wealth transfer occurs is the vicious cutbacks to public services. In the privatization of public utilities. In the failure to build social and affordable housing. In the race to the bottom in wages and conditions. Big capital always gains massively in the periodic busts that it causes and those advances are always made at the expense of the working class as borne out clearly in the economic data. It’s a vicious neoliberal Catch 22 for ordinary people justified using bogus economic propaganda. The commercial banks are dependent on their host nations. They are licensed by the nation state which authorizes them to create new bank deposits (denominated in the state’s monetary unit of account) when they issue loans. The state then issues new reserves as necessary to offset those new bank deposits while allows the commercial banks to settle accounts between themselves and the central bank using the reserves while maintaining the central bank target interbank interest rate. Effectively the capitalist nation states have privatized most of the money creation function and sub contracted it out to the commercial banks. This is the incredible power to extract real wealth (labour) from the working class that has been granted to the commercial banks under the capitalist system. Of course under a socialist system the banking function would be nationalized and operated as a public utility to provide for the welfare of all. Interest bearing lending would cease to exist and money would simply be a unit of measure to direct economic activity to meet human need. MMT helps to illustrate the absurdity of the capitalist model chasing these monetary units of measure to the point of destruction of the habitable biosphere. “For me it is always a normal part of thinking to go back to Marx because his dissection of capitalism – the sources of profits and the importance of seeing beyond the superficial exchange relations and thus understanding class relations embedded in production – has not, in my view, been bettered. And now a banker is suggesting that need to read Karl Marx………………….The assault on regulation and the attack on workers’ rights brought about a growing gap between labor productivity and real wage growth. The result has been a dramatic redistribution of national income toward capital in most countries. For example, in the G7 countries between 1982 and 2005 there was a 6 percent drop in the share of national income paid as wages (as opposed to interest or dividends). This was a global trend. In the past, real wages grew in line with productivity, ensuring that firms could realize their expected profits via sales. With real wages lagging well behind productivity growth, a new way had to be found to keep workers consuming. The trick was found in the rise of “financial engineering,” which pushed ever increasing debt onto the household sector……………………………I urge you to read the whole section in Theories of Surplus Value because its wisdom lies at the heart of the modern problem of high unemployment and stagnant growth………………………………Capital has never like full employment. Marx knew that. The last thirty years or so has seen the gains made by workers and their unions over a century of struggle eroded away by the relentless attack on their rights and conditions. ” Fact is that economics is a system science that deals with how the monetary economy works.” I should be most grateful if Egmont would explicate his theory of money then. Clearly there is a multiplicity of conflicting views. Surely they cannot all be the blathering of idiots? Egmont’s pronouncements seem to smack of the religious certainty of papal infallibility. At some point we have to stop talking political economy, which in the final analysis (Marx’s) demonstrates the inability of political economy to honestly describe the inherently unstable capitalist mode of production, and return to basics–that capital is a social relation based on the alienation of the vast majority of people from nature, themselves, and from the privately owned means of production. Any theory–MMT for example–that isolates an epiphenomenon (money for example) from the substantive object of its analysis (capital’s social relation) is crossing that bridge Marx referred to in critiquing Hegel. Marx and Engles, of course, respected Hegel and knew that their own work would be critiqued, revised, etc. That’s science. Egmont, apparently innocently, indulges in farce. In my opinion this criticism of MMT is accurate. As far as I know, MMT theory of the business cycle doesn’t go beyond of the “private sector preference to saving” that, in my view, it’s the other side of the coin to mainstream ridiculous “voluntary unemployment”. But I don’t see why the profit motivation of the business cycle couldn’t be added to MMT without making a fuss. In the same vein, people that see the economy through the MMT lens would be more well predisposed to the Marxist arguments that the people coming from the mainstream. I think this is a misinterpretation of what MMT is saying. If MMT though that the value of money can be decided arbitrary, by the state, by decree, they would not be so interested in inflation. MMT doesn’t think that the government sector can decide the value of money, or the quantity of money. In fact, they specifically tell us that what is possible to do is always determined by the “real economy” (no monetary resources). What they affirm is that the interest rate can be chosen by the central banks and that inflation can be managed by fiscal policy. I think this is empirically true. This is not what MMT says. The money that is destroyed by taxation is the money that is created by the government when it expends in the economy. This is a very different kind of money that the one that is created by bank deposits (see http://bilbo.economicoutlook.net/blog/?p=14620 for an explanation). In my view, at the end of the day, the main political message coming from MMT is that, frequently, all the resources available in the economy are not used because the private sector is not mobilizing them, whatever the reason the private sector has (in “the next recession” blog the reason is explained to my satisfaction). MMT says that the government has the power to mobilize those resources for the common good, it’s a political decision no doing it, and that the usual mainstream economic rationale (we have not enough money) makes not sense. This is also, empirically true, as we have seen in war economies. The conclusion is that the level of unemployment is chosen by the government, who is not serving to who should be serving, the people who elected them. Personally (this is not MMT canon), I would add that the reason unemployment is allowed and even encouraged, is because full employment would reduce profit, and that would reduce private investment. And this, I think, is more or less the Marxist perspective. The places where unemployment is low (USA for instance) are places where another kind of stick is used in the population, expensive medical or school services, high personal debt and so on. This perspective also explain why Keynesian recipes are fight by the business interest when, in theory (Keynesian theory), they should work also in its benefit. MMT shows that the situation is a political decision and not a inevitable consequence of the economy. Maybe, the only way to change is a revolution, I don’t know, but, in my opinion, illuminating these issues make changes more probable, not less. Where it says: “that the one that is created by bank deposits” it should be “bank lending”. I agree but I have found my fellow Marxists to be very resistant to the idea that an external school of economic thought (MMT) may have correctly described an aspect of the present capitalist system which Marxist thinkers may not have comprehended. I believe this is shortsighted. Marx was able to identify the correctness of the dialectic in Hegel’s philosophy even though it was buried in his misguided idealism. We should take the same approach to MMT and recognize the veracity of their analysis and description of the capitalist monetary system and then draw our own conclusions as Marxists. I think we can assist by trying to elaborate on MMT some more in Marxist terms. MMT explains that taxation legitimizes the state’s currency and makes it widely accepted as a means of payment in society. But ultimately what underpins taxation is the force of the state to coerce people to pay their taxes payable only in the state’s currency. So as Marxists we understand that in the final analysis the state exists as “armed bodies of men” directly protecting the capitalist property rights. But MMT also lets us see that the state’s near monopoly on coercive force (IRS, police, courts, prisons, military etc) indirectly defends bourgeois property rights by imposing taxation and so validating the capitalists accumulated monetary claims on the collective resources of society. Which of course have been accumulated through the direct and indirect exploitation of labour. The bourgeois states now go one step further and load much of the tax liability on to the backs of the working class while the free movement of capital and its political/legal clout allows it to avoid/evade much of its tax obligations through loopholes (actually design features) tax havens etc. in a double blow to labour. In the final analysis MMT explains that the state as the currency issuer is not obliged to operate under the profit motive as private sector capitalists are and so can concern itself only with the use value of commodities rather than the exchange value which is the absolute concern of the capitalist. So this understanding of the state immediately poses the question of a planned economy where commodities are produced on the basis of need rather than for profit accumulation. In this way the bourgeois in their formation of the capitalist state have created another potential gravedigger for themselves if and when the working class wins the struggle for state power. This brings us to a notion that’s been increasingly bandied about, called Modern Monetary Theory or MMT. The theory basically asserts that the government is a monopolist in creating currency, and that unemployment is essentially the result of the monopolist choosing to excessively restrict the supply of currency. The corollary is that sufficiently large government deficits, financed by currency creation, can eliminate unemployment. Essentially, MMT proposes that the government has an effectively unlimited ability to spend, with no risk of insolvency, simply by printing more currency. One might immediately respond that this proposition ignores the potential for inflation, and one would be correct. If that was all there was to the theory, it would sink like a stone. Though some proponents give lip service to the possibility of “resource constraints,” that possibility never actually seems to constrain anything. To provide an intellectual foundation, MMT is typically described using accounting identities that relate government deficits to money creation. I’ll present these in a (hopefully) simple way below. These identities are nothing more than arithmetic, but they dress the theory up enough that its basic prescription – go ahead and print money to finance endless deficits – seems a bit more dignified. Like the question ‘What holds up Atlas when Atlas holds up the world?’ it’s not enough to answer that he’s standing on a turtle. It’s got to be turtles all the way down. The value of money has an enormous psychological component, and if that psychological confidence breaks, the result is inflation or hyperinflation. If you’ve read my own stuff for any length of time, you’re familiar with ideas like the savings-investment identity, and it’s no revelation that government deficits have to be financed either by debt creation or money creation, so fiscal policy is never actually “independent” of monetary policy. But phrased in particular, and slightly misleading ways (like “The only way for the private sector to accumulate a surplus is for the government to run a deficit”), these rather boring accounting identities are used by MMT as tools that promise only benefits from currency-financed deficit spending. This is the savings-investment identity, and is always true by definition. The first term here is “domestic saving,” which is simply the income of U.S. residents after subtracting taxes and consumption (Y – T – C). This figure includes both household and corporate saving. The second term (M – X) is “foreign saving.” If our imports exceed our exports, it must be that foreigners have produced more than they have consumed, and are sending the difference to us. In other words, they have saved. What do foreigners get in return for the net goods and services they send to us? They get U.S. securities. We have to pay for our imports, so every dollar of goods and services we import has to be paid by exporting something. If we don’t pay by exporting goods and services, then we pay by exporting securities to foreigners instead. So imports minus exports (M – X) measure the net amount of foreign saving required to balance our payments, and the net amount of U.S. securities that foreigners accumulate. The third term (T – G) is “government saving,” which is currently an oxymoron, but this figure can of course by negative. The overall equation says that all investment – and here we’re talking about any output of the economy that isn’t consumed, including factories, housing, equipment, inventory, unwanted inventory, and all other unconsumed output – is the result of various sectors of the economy refraining from consuming, that is by “saving.” That’s an identity because either output is consumed or it isn’t. Period. The proponents of MMT are fond of saying “The only way for the private sector to accumulate a surplus is for the government to run a deficit.” This makes surpluses sound like a very good thing, and therefore makes government deficits sound like a good thing as well. Examining the savings-investment identity more closely, two things should be immediately apparent. First, government deficits only raise private surpluses if we’re also counting foreigners among those who are accumulating surpluses, and also if we’re holding the amount of gross domestic investment constant. An embedded assumption here is that no amount of government spending can “crowd out” private investment. Second, and more importantly, what those “surpluses” really represent is output that isn’t consumed by the private sector (though the government presumably uses it for their benefit). So what kind of “surplus” is actually “accumulating” in private hands when the government runs a deficit? Well, the private sector accumulates government liabilities, either in the form of 1) U.S. government debt like Treasury bonds, or 2) base money, created when the Federal Reserve buys Treasury bonds and pays for them with objects that are spit out from a printing press – just read the top line of those green pieces of paper in your wallet. What we actually have from the savings-investment identity is a slightly less palatable proposition: “Holding gross domestic investment constant, government deficits must result either in the public accumulating government liabilities or by foreigners accumulating financial claims on the U.S.” You can see why the proponents of MMT don’t use that one. What kind of ‘surplus’ is actually ‘accumulating’ in private hands when the government runs a deficit? Well, the private sector accumulates government liabilities, either in the form of 1) U.S. government debt like Treasury bonds, or 2) base money, created when the Federal Reserve buys Treasury bonds and pays for them with objects that are spit out from a printing press. Keynesian economists are fond of arguing that government spending has a “multiplier” effect on output. This argument, like its cousin, the “money multiplier,” mainly relies on the arithmetic of infinite series, rather than any actual considerations of economics. In both cases, the quiet assumption is that there are no constraints on output, resources, productivity, or risk-taking, so that new output immediately appears in response to new demand, and demand immediately increases in response to new income. Turtles all the way down. Having abandoned any concept of scarce resources, this isn’t really economics at all, but the profession feeds it to the youth early enough that they grow up without questioning any of it. One has to remember that Keynes published the General Theory in 1936 in response to a deflationary depression, three years after the unemployment rate peaked at 25.6%. At that time, the ratio of government debt to GDP was 40%, up from just 16% in 1929. The assumption that output might be very responsive to new demand, without inflation, may very well be attractive in that environment, but is not particularly winsome in an economy with an unemployment rate down to just 4%, with the Federal deficit pushing $1 trillion, and total public debt now over 104% of GDP. In my view, the current enthusiasm for MMT is an artifact of a long disinflationary period since the 1980’s, during which the U.S. has financed increasingly large deficits by issuing liabilities, while the U.S. public and global investors have accumulated them without a major loss of confidence in their value. The recent experience with QE has hardened the belief that the appetite of the public for these liabilities is infinite. The proponents of MMT are fond of saying ‘The only way for the private sector to accumulate a surplus is for the government to run a deficit.’ This makes surpluses sound like a very good thing, and therefore makes government deficits sound like a good thing as well. What we actually have from the savings-investment identity is a slightly less palatable proposition: ‘Holding gross domestic investment constant, government deficits must result either in the public accumulating government liabilities or by foreigners accumulating financial claims on the U.S.’ You can see why the proponents of MMT don’t use that one. The problem here is that public perceptions about inflation are almost always conditioned by the recent behavior of inflation itself. High recent inflation reinforces the belief that inflation will be permanent. Low recent inflation reinforces the belief that infinite amounts of money can be created with no risk. Both situations reflect a basic fact about inflation: the most reliable predictor of inflation isn’t money growth, or output growth, or government deficits, or the rate of unemployment, but rather the rate of inflation itself. Again, inflation has an enormous psychological component: it reflects a loss of confidence that the liabilities issued by the government will retain their ability to purchase the same amount of real goods and services that they can purchase today. The key uncertainty about inflation is that it is largely a psychological event, and depends heavily on the confidence, or loss of confidence, by the public that government liabilities (bonds and base money) can be held without deterioration in their value. In the 1960’s, the U.S. relied on that sort of confidence when it was under the gold standard, yet ran increasing government deficits that were essentially funded on the expectation that U.S. investors and foreign governments would simply accumulate them indefinitely. The French criticized this behavior as an “exorbitant privilege,” resulting from the position of the U.S. dollar as the benchmark currency for international transactions (which was established by the Bretton Woods agreement in 1944). By the 1970’s, the psychological confidence of the public in the dollar was shocked by two events that disrupted expectations for price stability. First, foreign governments became intolerant of accumulating dollars, and demanded to convert them into gold. In 1971, Nixon had to close the gold window, ending the de-facto gold standard that had supported stable exchange rates. Shortly thereafter, inflation exploded, and it was later amplified by supply shocks resulting from the OPEC oil embargo. It’s not clear whether we’ll see a similar loss of public confidence about price stability in the years ahead, but I’m not at all optimistic about the idea that government debt and money creation can expand indefinitely without consequences. Just as we use the uniformity of market internals to gauge the psychological inclination of investors toward speculation versus risk-aversion, our own focus will remain on the uniformity of inflation-sensitive assets (precious metals, oil, commodities, real assets, bond prices, inflation-protected securities, and so forth) to gauge psychological shifts regarding inflation. In the meantime, what’s the best way to think about the benefits and risks of government debt and deficits? The central thing, I think, is to avoid discussing any of it without also thinking carefully about what the money is being used for. If the government has the opportunity to start a project involving infrastructure or renewable energy that isn’t possible for the private sector to coordinate, and has a very high likelihood of throwing off 10% annual benefits to the economy, indefinitely, it may be a very good idea to run a deficit and issue debt to finance that project. The same is true even for social initiatives with indirect benefits that might be measured in public well-being rather than cash. That paragraph is the essence of MMT. It carries with it no particular requirement for the government to spend in a way that leads to durable expansion in economic activity, sufficient to ensure that the new liabilities can be carried indefinitely without an ultimate collapse in their value. The failure to seriously consider and embed those issues as central elements of the theory is what makes MMT (and lots of other models) little more than arithmetic, rather than economics. Put simply, debt and deficits can only be judged as beneficial or detrimental to the extent that we know how the funds are being used, and the extent we believe that the direct and indirect benefits to society are enough to repay or at least permanently carry the resulting liabilities. One of the first things you’ll hear in an undergraduate economics class is that “Economics is the study of how scarce resources are allocated.” Then, without any sense of irony, most professors will launch into Keynesian theory, money multipliers, and other models that effectively assume no scarcity or resource constraints whatsoever. The standard of living of any nation, after all, is measured by the amount of goods, services, and intangible well-being that individuals in that nation can enjoy. The productivity of any nation is measured by the amount of goods, services, and intangible well-being that individuals in that nation can produce. I’d absolutely define both of these broadly, so that individual well-being is given adequate weight in assessing our collective prosperity, and I’d also include non-monetary factors like environmental sustainability. However we might account for all of that, our long-term standard of living is always dependent on how we channel our resources to nourish our long-term productivity. So many discussions of economics completely miss that point. In my view, it’s ultimately the point of economics that matters most. It seems you are reading more MMT critiques than MMT. MMT absolutely acknowledges that real resources (or “value” as you call it) present a limit to what can be achieved. That is *not* a limit on the government’s ability to issue money, it is a limit on what can be achieved in real terms. Most of your article is simply useless as you claim MMT ignores this, consequently you are attacking a strawman. 1. MMT works in terms of deficits, not total government spending. 2. Government deficits are only one component of spending. You also need to look at private spending and the external sector for each country. You need to read a primer on the MMT sectoral balances. 3. It is unsurprising that the countries with higher unemployment have higher deficits. The automatic stabilisers cause this, along with reduced taxation due to reduced private activity. 4. Bill Mitchell does vast amounts of work on the data. Please have a look through his blog to get an idea of the detail. I think the key problem with your analysis is it has no time element: when you look at govt deficits and other stats over time (which he frequently refers to) the relationship to unemployment becomes quite clear. Lastly. MMT is on the same side as Marxism. MMTers want to see a dramatic overhaul in the way government is run. Just because Marxists want to go further does not preclude supporting an intermediate step, particularly one as dramatic as a job guarantee. MMT may also be instructive in helping to decide how Marxist utopia (which I presume you desire) might function assuming Marxists don’t plan to destroy all money… (apologies for my lack of knowledge on this point). Hi Anthony – yes under capitalism the capitalist sector dominates investment and the productive process, So government services and the state sector are controlled in the interests of capital, although labour resists this, with varying degrees of success. State non-profit health and education are ‘productive’ for people’s needs, but are not productive for capital. That is why capital tries to limit the cost of these necessary services. It is a basic contradiction of capitalism – between value (profit) and use value (needs). In my view, if value dominates, then governments cannot deliver needs. In answer to your empirical points (briefly): 1) yes MMT does work in deficits, but if they are permanent as MMT wants, then total govt spending can become a benchmark for analysis 2) I know the primer! The Marxist view is the opposite of the Keynesian/Kalecki/MMT view ie it is not government deficits that is the causal determinant in the macro identity but the private sector (or to be more exact, the capitalist sector – MMT never break the private sector down). When you do it the Marxist way, the process appears differently. https://thenextrecession.wordpress.com/2012/04/21/paul-krugman-steve-keen-and-the-mysticism-of-keynesian-economics/ https://thenextrecession.wordpress.com/2018/12/10/back-to-front/ 3) agreed – I said this but it tells you that the government balances are not exogenous but derivative 4) I’ve read Bill’s data and do not agree with his interpretation of it. I may return to explain this in a post or future fuller paper on MMT including empirical analysis. On the first point: I did not realise that you distinguish between value and needs, that really makes things hard to measure. So can you please confirm: in the socialist utopia does money still exist or not??? If it does not, what better accounting method do you have to decide how resources are distributed? On the empirical points, your response seems like dissembling. Your comments at point 1 might make sense in a theoretical world but you used real world data. Point 2 you start talking about something else entirely: all I was saying is you cannot draw the graph you drew – . Point 3: Again, not sure how this justifies the graph being used in the way you have sought to use it. Seriously – your arguments do not change the fact that the graph is wrong and it is not academically right to keep that graph up and write conclusions about it the way you have. You are misleading your readers. Under capitalism, Marxists argue that there is precisely a difference between value (as expressed in money) and needs (or use value).Capitalist production is not production for need but for profit. It is not just a money economy, but is a money-making economy and this comes into conflict with needs of the many. This is a basic Marxist proposition so I am surprised that you did not realise it – even if you dont agree with it. Governments can create use value to meet needs but they dont create value (or surplus value and profit). That is why capital does not like a big state – the state is necessary to keep law and order, conduct wars and even provide basic services. But it is not profitable, on the contrary, it uses up the value created by exploiting labour in the capitalist sector. My “socialist utopia” (this sounds a little sarcastic about socialism from a socialist?) as you call it, is a society owned and controlled in the common with no private ownership of the means of production that moves towards a society of abundance achieved by the fullest use of technology and human ingenuity so that people do not toil long hours, and where ‘leisure time (ie real work, not toil) dominates and where necessary things and services are available free at the point of use. Such a society can only be achieved when the capitalist law of value has disappeared on a world scale. Only then would it possible to see the end of money because commodities for sale and exchange would then become products and services for use and capitalist exchange would have disappeared. Before then, money (as measured as best we can by the value it represents ie the socially necessary labour time) remains the accounting method. By the way, we Marxists call this the Monetary Expression of Labour Time (MELT), which we try to measure for empirical work. All this is pretty basic Marxist economics, which is about analysing capitalism, not describing socialism. Sorry that I appeared dissembling to you – it was not my intention. But it is a blog post and it is not always possible to fill out all the analysis. Yes, I use “real world data”, or money measures if that is what you mean (see the para above to explain why). My graph on employment and govt spending I still think had some validity on the issue of MMT (which involves permanent govt deficits as I understand, not counter-cyclical ones that orthodox Keynesians advocate). But you are right, we need to look at other graphs and correlations ie budget deficits and unemployment; budget deficits and growth etc. I have done some work on this in the past and did a little more when this debate began. My main conclusion from my results so far is that growth and employment are more highly correlated with the profitability of capital than with budget balances. But Im going to do more work before I produce a more comprehensive paper on MMT. I dont think I am misleading my readers – at least not in bad faith. But maybe the data and any future empirical analysis will not support my view. But I am sure you agree, without empirical analysis, the debate could remain at the level of assertion only. But the MMT circuit fails to show what happens with the money that capitalists and households have. You are absolutely right on that. In MMT, M (in value) can be increased to M’ purely by state dictat. For Marx, M can only be increased to M’ if capitalist production takes place to increase value in commodities that are sold for more money. This stage is ignored by MMT. The MTT circuit starts from the state to the non-state sectors and back to the state. But this is the wrong way round, causally. If I purchase 2,000 lbs. of cotton for £100, and resell the 2,000 lbs. of cotton for £110, I have, in fact, exchanged £100 for £110, money for money. For illustrative purposes, Marx plays the role of capitalist. He has £100 and increases that amount to £110 through the sale of a commodity. There is a difference of £10. We agree on this: Marx explains it through exploitation. MMT does not. But you take for granted the existence of £ in the hands of capitalists. What MMT says is that capitalists have £ because the government (not the state: MMTers are a bit fastidious about the use of the precise terminology; I agree with them on that) (1) created the currency pounds sterling, and (2) spent it enough so that the capitalist had £100 and someone else (say, a household) had £110. Like I said, my comment refers only to that paragraph. Your example simply shows that the state (government) controls the monetary unit that all accept as money. The question is: does the state (sorry government) provide the money capital as an exogenous input for the capitalist who then starts the accumulation process OR does the capitalist decide to start the accumulation process and then get the necessary money (endogenously) either from previous profits held in the bank or through borrowing? If the capitalist borrows, the demand for money will rise and the state (central bank) will print the money. But if the (government) runs a budget deficit and the CB prints money to cover it, whether that leads to more value and more money depends on the capitalist. There is no surety that it will be used for accumulation as the capitalist has not demanded it. Such money could be hoarded. If households are given the money directly to purchase more commodities, again whether more commodities are produced or prices just rise depends on the capitalist. The state could well be pushing on a string. Of course, the state (government) could start its own production operation and replace the capitalist, but then we no longer have capitalism. Your example simply shows that the state (government) controls the monetary unit that all accept as money. Let’s proceed by steps. First, there must be a reason the state (if you insist) controls the monetary unit, as you admit. Well, what is that reason, if not taxes? Note that I imagine MMTers would feel happy if the answer is taxes. But in reality, that is secondary. What really matters is that the state controls the monetary unit. Second, I beg to differ on your assessment. The capitalist and his/her customer had money in their pockets. Where did that money come from if not from the state? Or, more to the point, could you have printed that money? The question is: does the state (sorry government) provide the money capital as an exogenous input for the capitalist who then starts the accumulation process OR does the capitalist decide to start the accumulation process and then get the necessary money (endogenously) either from previous profits held in the bank or through borrowing? The first distinction we notice between money that is money only, and money that is capital, is nothing more than a difference in their form of circulation. And I find it perplexing because in your own question you yourself suggested the answer (i.e. your reference to “money capital”)! If the capitalist borrows, the demand for money will rise and the state (central bank) will print the money. I think we are not reading from the same page. If someone borrows money from a bank, four things happen: the bank adds (1) a liability (deposit) and (2) an asset (loan) — by the exact same amount — to its balance sheet (therefore, the bank’s equity does not change), and the borrower adds (3) a liability (loan) and (4) an asset (deposit) — by the exact same amount — to his/her balance sheet (therefore, the borrower’s equity does not change either). That happens regardless of whether the borrower is a capitalist borrowing money for his/her business (i.e. “money that is capital”), or Joe Sixpack paying a book with his/her credit card (i.e. “money that is money only”). There is in principle no need for the central bank to “print” (neither in a figurative, nor in a literal, sense) any money. Check as well Figure 2 (page 19). Incidentally, the fact that assets and liabilities match exactly means that once the loan is paid, the bank money “vanishes”, unlike high-powered government money.